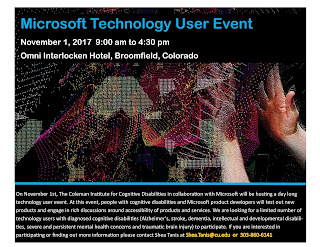 On November 1st, The Coleman Institute of Technology, in collaboration with Microsoft, will be hosting a day long technology event. 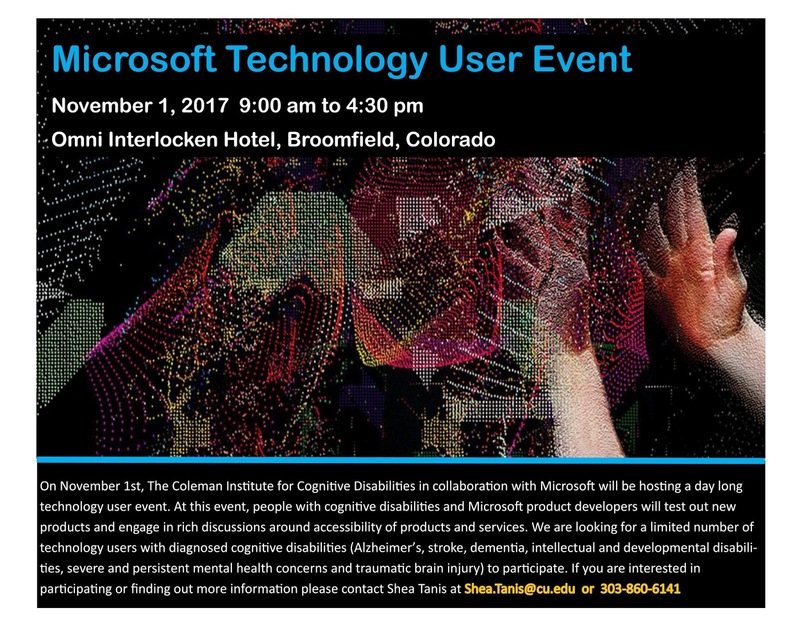 At the event, people with cognitive disabilities and Microsoft product developers will test out new products and engage in rich discussions around accessibility of products and services. They are looking for a limited number of technology users with diagnosed cognitive disabilities (Alzheimier’s, stroke, dementia, intellectual and developmental disabilities, severe and persistent mental health concerns and traumatic brain injury) to participate. They are still looking for participants, so if interested, email Shea Tanis at Shea.Tanis@cu.edu or call 303-860-6141. 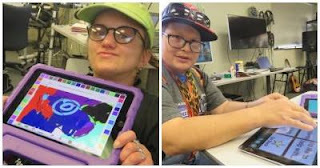 I’d like to use today’s Tech Tuesday post to thank Albertsons Companies Foundation for their recent donation to help purchase iPads for Imagine!’s CORE/Labor Source (CLS) department. In just a few short years, iPads have moved from merely fun items for CLS to have to absolute necessities. The amount of life-long learning that can and does take place using the iPads at CLS is astounding, and we are so grateful to Albertson’s for the gift. Pictured below, students at Imagine! 's CORE/Labor Source hub in Longmont take advantage of an iPad class to practice their art skills and play task oriented games. 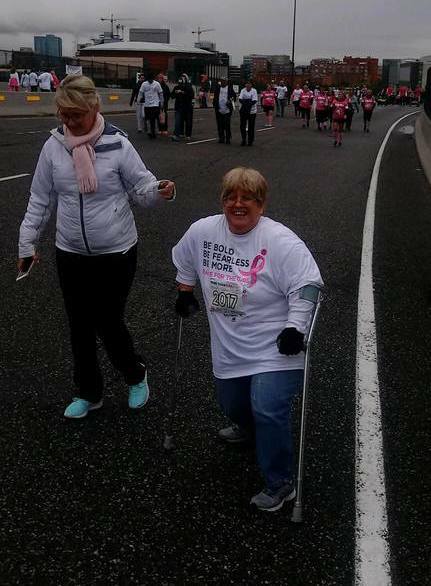 Becky Toliver, who accepts services from Imagine!, trained for the one mile course at the 25th annual Susan G. Komen Race For The Cure in Denver. She partnered with Kelli, a friend from church and former Jazzercise instructor, to prepare for the mile long walk. Becky works for Real Capital Solutions in Louisville, CO, and walked in their name. “I had so much support from family, friends, and co-workers.” Near the end of the walk, Kelli walked ahead of Becky and Roy to let the cheerleaders and Becky’s friends know that she was on her way. Everyone, including the president of Real Capital Solutions, cheered “Becky! Becky!” or "Turbo Toliver" as she crossed the finish line and walked 2.2 miles more than she trained for. Becky felt this was an important walk so that she could honor the loved ones in her life who have battled or are battling cancer. The race was longer than she expected and still turned out to be a great day! 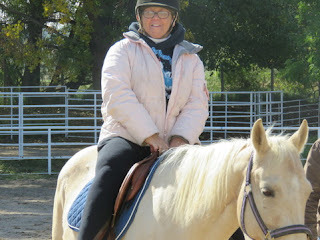 She and Kelli continue to meet on the weekends to walk and stay fit. at Race For The Cure in Denver. Becky and her husband, Roy. Here’s a nice recollection from Out & About participant Brittany, who shares how the activities she takes part in have taught her new ways to be healthy and active. 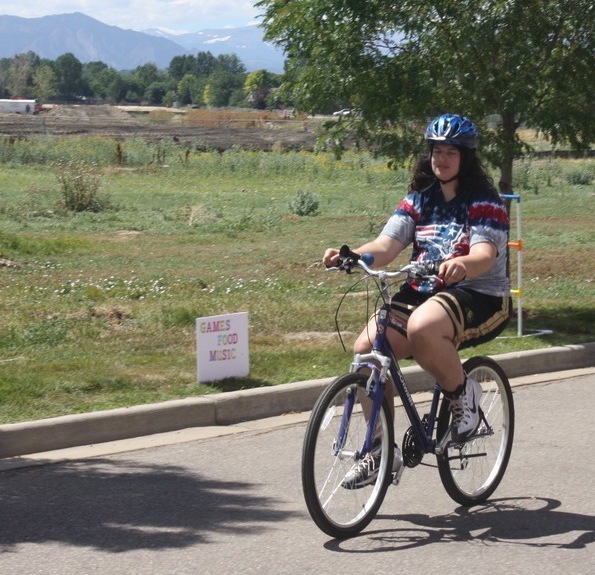 Since 1984, Imagine!’s CORE/Labor Source (CLS) department has assisted individuals with intellectual and developmental disabilities across Boulder and Broomfield counties in finding gainful employment through supported employment services. Supported employment offers people who have a disability the opportunity to develop vital job skills and become active participants in their communities, while working toward their goals through group and independent employment opportunities. 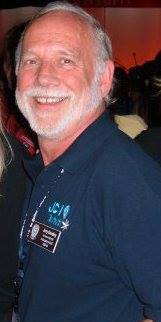 The benefits extend far beyond helping the individuals we serve, however. Businesses using our services are able to reduce recruitment and training expenses as they benefit from a diversified employee pool. Partnering with CLS is a "win-win" situation that is beneficial all around. CLS currently partners with businesses across Boulder and Broomfield counties to provide supported employment solutions for hundreds of individuals. Check out the video below, created last year, celebrating just some of those business partners. We are grateful for their support and commitment to community inclusion.